Many of you have asked about my triathlon training and I think it's high time that I start documenting some of the journey. As of today, I am seven weeks into my half ironman training and 16 weeks away from RACE WEEK! First a little background: for the first time in several years I'm using a triathlon training plan. My new best friend is Don Fink - a triathlon and running coach and author of Be IronFit. I don't actually know him and I've never seen him, but I am following his advice and his training plan to get me across the finish line on October 29. His method entails heart-rate training. His belief is that "effective heart rate training is the best way to maximize your training benefit and minimize your training time." I read the book twice before I even signed up for the B2B. I compared the plan to two others I trusted. I asked two local iron triathletes. [Both said, yes, it's a great idea! I've never done it, but it's supposed to work!] I debated, drew straws, thought twice, listed pros and cons and finally committed. Two things sold me. First, THIS ARTICLE by Mark Allen. 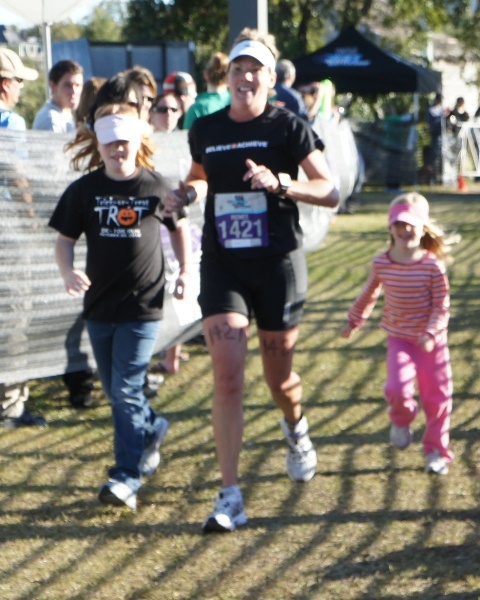 Second, the picture below of my friend and iron-distance triathlete Renee Griffin! I watched as she crossed the B2B half iron finish line. She was laughing and smiling and practically dancing across with her two daughters. Plus, she was FAST! My first step: calculate my proper heart rate zones. I started with the standard 220-my age = Max Heart Rate equation. I compared it to Mark Allen's method and tweaked it with the Karvonen method. My next step: stay in the zone. The first phase of the plan is ten weeks of building an aerobic base by staying in Zone 2 -- 75%-85% of my maximum heart rate -- which is about 133bpm - 155bpm. I set my Garmin 405 and set out on my first run. I have learned so much in what my training partner calls OPERATION BASE PHASE [thanks, JYo]. Stay tuned for more adventures in the next few weeks, including mind games, racing dogs and getting the drift.